The White House on Friday defended physician Ronny Jackson from attacks coming from the left, releasing records that dispute allegations of wrongdoing against him. 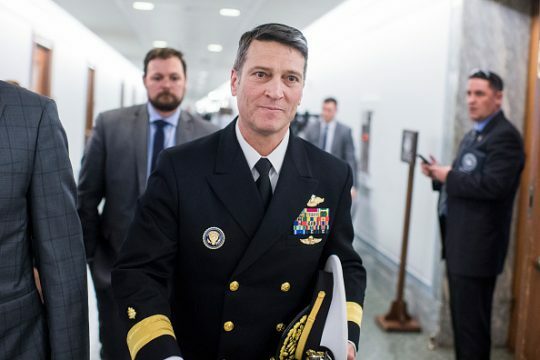 The defense follows the White House physician's decision to withdrew his nomination to lead the Department of Veterans Affairs. The White House said the records raise doubt about unsubstantiated claims from some Democratic lawmakers, who cited interviews with anonymous current and former colleagues on Jackson, that the White House physician overprescribed prescription medications, drank alcohol while on duty, and was involved in a car accident that might have involved alcohol, the Associated Press reported. The information that Jackson successfully passed regular controlled substance audits directly challenges Sen. Jon Tester's (D., Mont.) assertion that Jackson was known as the "candy man" inside the White House. Tester's office led the charge in collecting the allegations against the former VA secretary nominee. Tester spokeswoman Marmee Banks said there would be no comment until the office knew more about the White House records. On "Fox & Friends" Thursday, President Donald Trump defended Jackson at length, calling him an "incredible man" and said the allegations were "completely false and fabricated." Trump also called out Tester for airing the allegations and said, "I think Jon Tester has to have a big price to pay in Montana." This entry was posted in Politics and tagged Jon Tester, Veterans Affairs, White House. Bookmark the permalink.